When your kitchen sponge gets grimy and your shower curtain gets moldy, should you toss them in the trash or try to salvage them by cleaning? To find answers to these all-important questions, we asked a cleaning pro, John Cohen, the vice president of the house cleaning service Molly Maid, for his take on what’s worth cleaning and what’s best to throw away. From kitchen sponges to stinky dish cloths, we covered 7 of the grossest things you’ll find around your house. “Toss it!” A kitchen sponge is great at cleaning sinks and spills, but it collects bacteria quickly!” warns Cohen. The best way to keep it fresher for longer is to wring it out after each use and allow it to air dry. Because research hasn’t proven that microwaving a sponge is an effective way to rid it of bacteria, your best bet is to toss your sponge once it starts to tear or has a lingering odor. “Clean it!” Add a dirty shower curtain to your washing machine with detergent and a towel for scrubbing action,” says Cohen. “For higher-quality shower curtain liners, this tip can work numerous times.” Once the liner shows serious signs of wear, you’ll know it’s time to replace it. 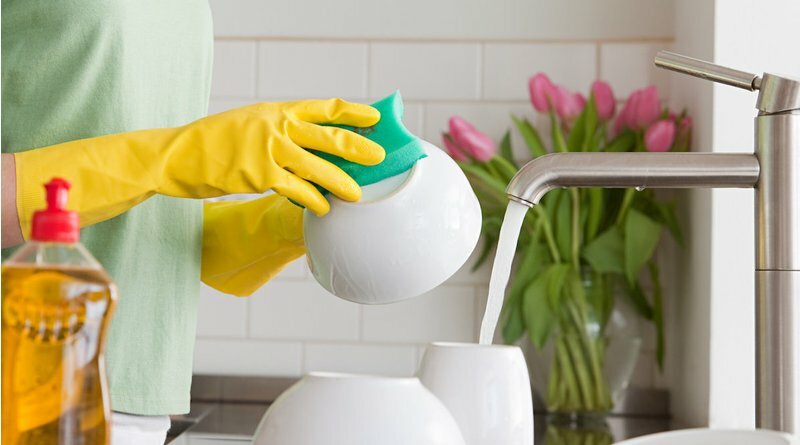 “Wash it!” Grease and food debris do not completely rinse off after use, so dish cloths need to be laundered regularly,” says Cohen. Change your dish cloths out every few days, and wash with bleach in between uses. Cohen also notes that you should avoid using dish cloths to clean surfaces where meat is prepared—opt for paper towels or Clorox wipes instead. You’ll know it’s time to buy new dish cloths when odors linger even after laundering. “Toss it (regularly).” This household cleaning hero is often ignored until the bristles fall out or stains and smells become intolerable,” notes Cohen. While the brush can be cleaned with bleach, you should still probably be replacing the toilet brush more often than you think. If cleaned with bleach regularly, replace it annually. If you don’t bleach it, replace it every 6 months or any time a gastrointestinal illness crosses your bathroom threshold. “Wash it!” Most pillows can be washed in warm water on the gentle cycle,” says Cohen. Except for foam pillows, you can use a mild liquid detergent and wash two pillows at a time to keep the machine balanced. If the pillow is made from a unique material, follow the manufacturer’s care instructions. “Add pillows to the dryer (care label permitting!) with tennis balls to keep them plump,” suggests Cohen. For most areas, washing your pillows twice a year is enough, but for warmer areas, bump it up to four times a year. “Clean it!” Fill it with a 50/50 mixture of water and white distilled vinegar for at least 30 minutes,” recommends Cohen. If the stain remains, add baking soda and scrub the stains using a cloth. If you’re still hanging on to containers that contain BPA or are missing their lids, it’s time to toss them. “Clean it!” Take it outside, squirt dishwashing detergent inside the can, and let the power of your hose provide the elbow grease to swish away trash remnants.” Then, allow the can to dry completely and sprinkle the bottom with baking soda to help absorb new odors. It’s time to buy a new can when it has holes or leaks, or if there’s debris that won’t come off with a simple cleaning.